Walt Spitzmiller is one of the world's foremost sporting artists and his work is widely held by private and corporate collectors, including many golf legends such as Arnold Palmer, Jack Nicklaus, Tom Watson and Lee Trevino, as well as the PGA Tour. For more than 30 years, he has been devoted to capturing the spirit of the game, its famous players and historic moments, and Walt has established himself as an iconic golf artist. His golf art has been showcased by the United States Golf Association, marking only the third time in the association’s history that an individual artist was featured at Golf House. Many paintings hang in The World Golf Hall of Fame in St. Augustine, Florida. 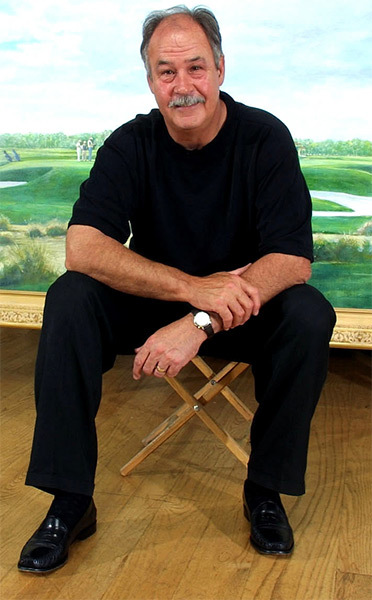 The PGA Tour commissioned walt to create original paintings of the recipients of their lifetime achievement awards, including Arnold Palmer, Jack Nicklaus and president George H.W. Bush. The Tour also had Walt paint the members and two captains of the 2009 Presidents Cup teams and these works were presented as commemorative gifts to the participants. For many years, Walt’s art regularly illustrated stories in Sports Illustrated and Golf Magazine, and he was the chief contributing artist to Senior Golfer Magazine, as well as a special contributor to Outdoor Life Magazine. In 1978, he covered the Masters for Golf Digest and in 1984 he created a portfolio for Time Magazine and Nissan Motors on the 1984 Olympics in Los Angeles, California. Additionally, Walt’s art may be found in the Baseball Hall of Fame, The Smithsonian Institution, The American Museum of Illustration and The Rodeo Hall of Fame.